The Immigrant is one of those films that is completely mediocre in terms of how it makes you feel when it's over and the impression it leaves on you, but is dressed up so fancy in period decoration and costume as well as high-caliber talent that it would like you to gloss over the fact it's completely average in favor of the hat trick it was able to pull in making you think it might actually be something exceptional. There is no reason to think it wouldn't be anything of the sort as it sports a leading Joaquin Phoenix performance, something you only seem to get these days if you have something specifically special for the actor, yet here Phoenix seems to be trying to make something out of nothing for the most part and is more than likely doing this as a favor for frequent collaborator James Gray (We Own the Night, Two Lovers) while the rest of the cast that makes up the leading trio is either hardly given anything to do (Jeremy Renner, also trying hard and only coming off more successful because his character is more pleasant) or is Marion Cotillard who typically signals truly sophisticated cinema, but here turns out to be nothing more than a one-note performer that we're agitated by and therefore unable to sympathize with at all. 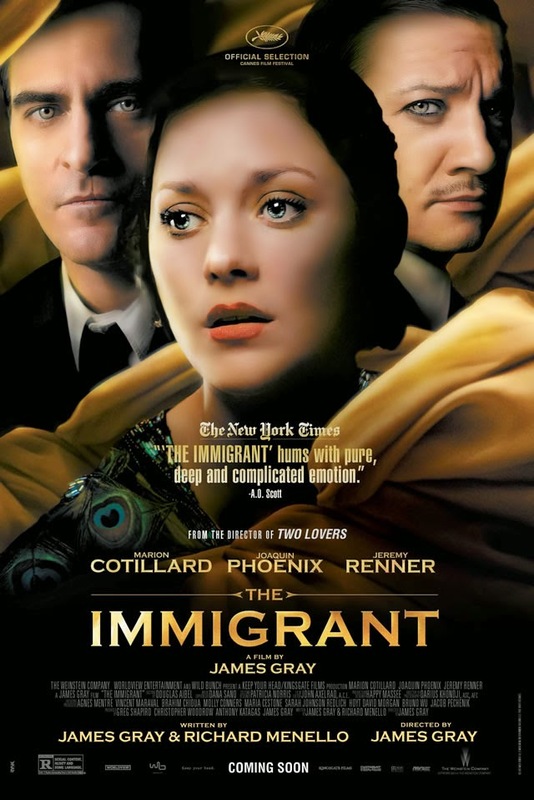 As I sit here and write about The Immigrant I'm confronted with the fact that I went into this not knowing what to expect really in terms of what kind of cinematic experience it would be, but as with most films I based expectations on credentials and this films in particular are golden. Phoenix all but swore off acting after Gray's last film and that was an interesting little drama that played with the tone of the film matching the tone of life as it walked the fine line between lighter, more comedic moments and the inherent drama present in the situation, but while that film felt balanced and purposeful The Immigrant is a complete melodrama that can't even match the interesting aspects of its exaggerated characters for the length of its running time. All of that said, I was never really bored and there is obviously potential with where this story could have gone, but it recesses too often and wastes so much talent on hand that I can't help but see this final product as little more than average and disappointing as opposed to what could have been. 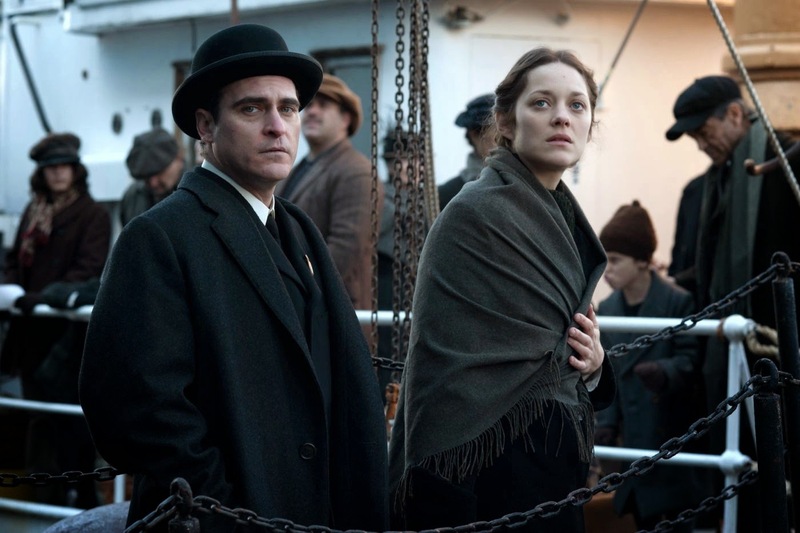 Bruno Weiss (Joaquin Phoenix) escorts Ewa Cybulska (Marion Cotillard) to "freedom" in 1921 New York. We are introduced to Ellis Island in 1921 as the Statue of Liberty looms with her back to the audience, an obvious visual given the content, but an interesting statement given what is about to unfold. We meet Ewa Cybulska (Cotillard) and her sister Magda (Angela Sarafyan) as they arrive in New York from their native Poland. It is clear Magda is not in the best health and so she is taken to the infirmary and if she doesn't get better she will be deported, an action Ewa simply cannot allow to happen and which puts her in a position where she is willing to do what it takes to find her and begin a life in America where their only aspiration is to be happy. Further complications ensue when Ewa attempts to register with immigration services and her her uncle and aunt she expected to be staying with don't show up and she is informed their address in invalid and does not exist. She is given little choice but to submit to the guidelines the officer spells out for her, but more importantly there is no chance given for her to speak her mind or tell her side of the story as she is hurriedly lined up for what seems to be inevitable deportation. It is only when she comes across Bruno Weiss (Phoenix) who initially seems a charming man with a giving heart and a soft spot for those who are suffering from no more than a poor set of circumstances or timing. He sees that Ewa can speak English, but more than that he sees her desperation and her beauty and he preys on them. He is able to remove Ewa from the exclusion line and gives her both a place to sleep and food to eat with the promise of work. It is when Ewa finds out the line of work that Bruno is in charge of and wants her to join that she sees his true intentions begin to show and her disgust is only matched by the feelings of affection he begins to develop for her. This anxiety and tension building between the two is only brought to a boiling point when Orlando the Magician (Renner) is introduced into the picture and pines of Ewa's natural beauty to the point he can't help but want to be with her. Making things worse is the fact Orlando and Bruno are cousins and while, for a brief moment it seems Orlando will allow Ewa to escape her misery and of accomplishing that ideal American dream things revert back to how they played out all along and bring the overall affect of the picture down that much further. What is most disappointing about The Immigrant has already been outlined in its wasted potential, but what really makes this such a shame is the fashion in which Gray wastes his potential by having Cotillard play a character that, to my knowledge was written exclusively by him and the late Ric Menello, allows such a talented actress to waste such a promising premise and beautiful set and costume design on a character so utterly boring and stubborn. We understand Ewa's fear and her frustration both with her situation and with Bruno, but while Phoenix gets to at least play a type of character that can be fun in certain doses and Renner is the most redeeming one in the film, Cotillard's Ewa is a consistent Debbie downer that has the headstrong determination of never giving up on her initial ideas of what she was going to make of herself and her life in America, but at the same time this kind of bullheaded approach to the situation she finds herself in that seems will always confine her to the nightmare she has found herself in. I enjoy a highly dramatic performance and Cotillard makes us feel her selfless mentality and I understand it is not her fault that the arc of her character is outside the bounds of her control, but in her embodiment all we see is the person who so easily could rise above what she sees as obstacles yet allows the constraints of invisible laws and an odd need for submission, especially to Bruno, that keeps her in the restraints she so heavily loathes and in reverberating effect restrain the movie as a whole. As for Phoenix, the more I think about the film the more I realize that while his character is the most hackish of them all purely in his characteristics and need to feel special, it is in the actors very calculated approach that we see Bruno not for the con man he so clearly is but for the way in which he surrounds himself with those who feel they need him and who he can pimp out at his disposal, with no second thought of the consequences for them, but for the pure feeling of power it affords him no matter how brief. Upon first seeing Renner in the film it seemed obvious he didn't fit in this time period or mesh himself with it as well as the others, but it is in further examining his Orlando that he comes to be the catalyst for what could have been while the screenplay gives the hand to Bruno and continues down a road we're already beaten down by; almost to the point we don't care anymore. Orlando the Magician (Jeremy Renner) is immediately taken by Ewa. This kind of overarching tone that Gray implies is never lifted and while there are interesting themes of manipulation and the obvious glimpse into a world we are so far removed from at this point that it is simply interesting to see the immigrant experience, there is only so much with a film like this that can pass as impressive and moving before we realize we are actually gaining nothing from the content. I don't know if it is due to the fact I really had high expectations for the film and that as it continued to play I began to realize I wasn't as enthralled or impressed as I expected to be, but for all it's inherent drama, its natural tragedy it never did anything to move me, but instead became somewhat of an empty experience. I was interested by virtue of the subject matter alone, but never came to care for any of the characters (except for maybe Renner's, but if you've picked up on anything you've likely figured out he isn't here long) and though the driving idea here is found in the roots of what the American lifestyle has become and how it has progressed and the shadows of people we once were, of our ancestors, I never felt a resonating sense of responsibility to these people or their issues, but instead was simply amused by them for two hours before the credits began to roll and then literally thought to myself, "that was fine and I understand the need for such stories to be told, but everything about it felt just barely above competent." That is the only way I can describe it and while I certainly appreciated the lush score from Christopher Spelman that attempts to add some deeper emotion to the film as well as the gorgeous cinematography that captures the authentic aesthetic of the early-20's in New York City there simply isn't enough here overall to recommend spending two hours on it which is the opposite of what I expected to say going into the film. It had so much going for it, but in its execution never becomes anything more than a dull murmur of what it could have been. I would have even taken the highly outlandish melodrama that could have been elicited from this set of characters and their story, at least that might have been more engaging, but all in all The Immigrant is a perfect example of precedence over substance.